Did you know that the average American spends 1.5 years in the bathroom over the stretch of a lifetime? That’s a little more than a third of their time spent driving a car. With so much time spent lingering in a bathroom, likely right after you awake and right before you go to bed, these private sanctuaries should inspire and set the tone for relaxation and repose. But is that the case? Do you find yourself soaking for hours in a luxurious master bath? Or do you quickly shower and then run to the powder room to use the sink because your spouse uses the shared vanity while you’re getting ready for work? At a minimum, your bathroom should function appropriately for your daily life. Bathrooms are more personal than kitchens. So our design process begins with asking the homeowner personal questions about their routine and privacy needs. Do you shower alone, or do you need room for a partner? Are your showers long and relaxing? Do you need a private space for the toilet? These intimate questions help us design a bathroom that functions around the homeowner’s individual needs. From there, we ask you to think big. Looking to transform your master bathroom into a serene retreat? Do you dream of a Jacuzzi bathtub that fits your entire family? What about a waterfall showerhead or hand shower or rainheads? Starting with your dream bathroom in mind helps us to scale back to what is doable within your budget and what makes sense for your life. Luxurious in-home spa created for a private-residence town home the Denver Highlands. The rainfall shower and soaking tub adjoin behind a floor-to-ceiling glass door, which seals to create a wet sauna. Of course we all have dreams, but reality lies within your budget. Whether you choose upscale or budget-chic, we’ll design a bathroom that fits within your means. We have access to the highest-end materials to budget-friendly yet aesthetically-pleasing design details. Viridis Design guides clients in outfitting bathroom finishes with style so that bathroom tiles schemes, tub, bathroom vanities, backsplashes, and faucets all complement each other beautifully and align with your personal style. We attend design conferences and bring some of the freshest bathroom design ideas and decorative elements into our client’s homes. Drawing inspiration from our extensive travels and employing a combination of natural materials and modern design elements, Viridis Design Studio offers a broad range of distinctive bathroom remodel ideas. Our uniqueness stems from outside-the-box thinking and the ability to encompass every aspect of your personality, as well as any individual needs and wishes, for a final design that is truly yours in every way. We work with contractors to ensure that the execution of your bathroom matches its exquisite design. While this job may appear seamless, it usually isn’t. Contractors aren’t always fully aware of the larger design picture and they receive shipments of finishings for the project at different times. We oversea the installation of every element to ensure that no small detail is missed. Viridis Design Studio upholds a strong reputation for designing impeccable bathrooms. With affordable options in finishings like tile, stone, and cabinets, there really is no reason to settle for a basic bathroom. Whether you are designing a new build home, transforming an industrial residential space, remodeling a restaurant, or designing a corporate office, your powder room, guest bath, or master bathroom will impress your guests and become a space you won’t mind revisiting. Truly an in-home luxury, a personal spa within your own residence serves as a daily retreat. We believe that a stunning bathroom starts your day with energy and allows you to unwind at the end of the week. We specialize in spa bathroom design and love the creative process of each and every concept that we create. If the kitchen is the social hub, then the bathroom is the private oasis. Each are equally important in generating energy and inspiration within your life. Historically, in cultures across the globe, people used steam baths for religious ceremonies, community spaces, and detoxification. Better technology in today’s spa world has brought the modern-day steam shower into homes. Improved vaporproofing knowledge and application has emerged, making the control of humidity and wetness much easier. A steam shower doesn’t need to take up an entire room. When utilizing the right materials and sealing a shower correctly in order to create a thick fog, we turn small spaces into pockets of everyday luxury. Energize your day by beginning it in a personal steam shower that is customized to fit your individual style. 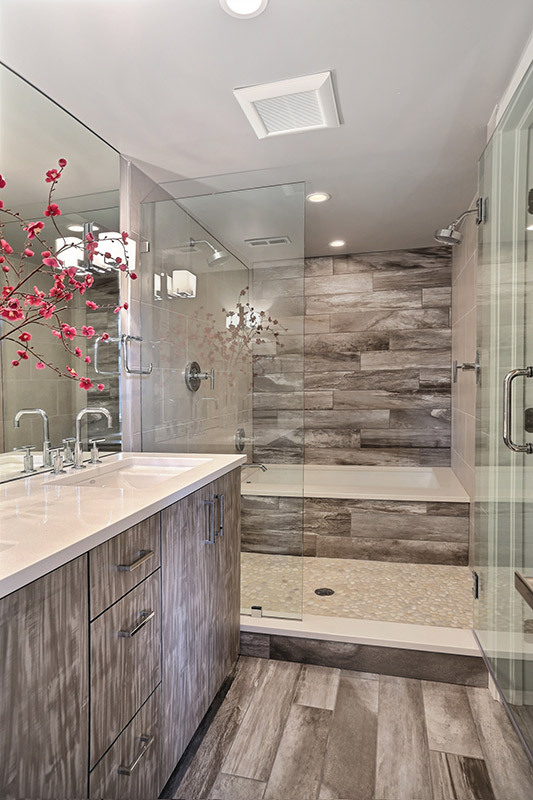 If you live in Denver, CO, or surrounding areas and would like to learn more about our bathroom ideas and remodel services, please do not hesitate to contact us today. Reach Viridis Design Studio by phone at (303) 489-9958 or by filling out our online contact form. Our expert designers are eager to answer your questions and begin your project!